These tiny robots can fit on the face of a penny. Ion propulsion engines are currently powering satellites outside our solar system, but so far, the technology’s applications have been limited here on Earth. These engines work by propelling electrons into a gas-filled chamber; when the electrons collide with gas atoms, the collision bumps an electron off the atom, rendering its charge positive (and making it into an ion). A grid at the end of the chamber with a negative charge then pulls the atom out of the thruster with a force that propels the craft forward. That tiny atom-sized force, however, can’t compare to the power of battery or fuel powered engines, so ion thrusters have never been practical for any applications on Earth. Their uses are limited in larger scale applications save space travel, where efficiency is king and the surrounding vacuum provides no resistance. Now, however, this futuristic source of power might run Earthbound miniature robots created for a wide range of uses. University of California, Berkeley engineering student Daniel Drew grew up immersed in science fiction as a child, a background that inspired him to study miniature robots as an adult. Drew imagined miniature robots like insects that could take on a range of practical problems, and wanted to create them. The problem was finding a way to power these tiny robots without making them bigger. 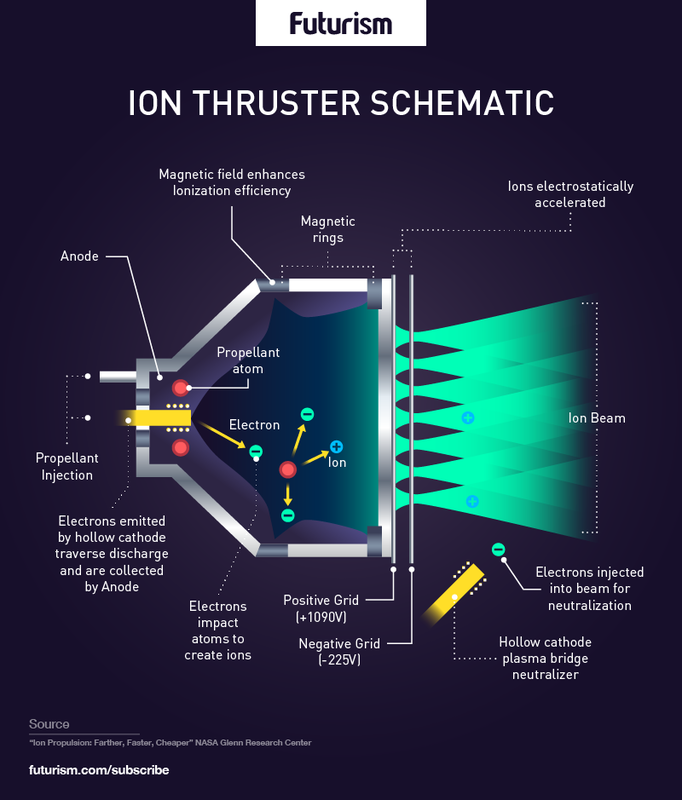 Enter the ion thruster. After designing ion thrusters on a tiny scale, Drew began to integrate them into the designs of his miniature robots. He called the final product “ionocraft”: robots that are approximately one-half of one inch square — small enough to fit on the face of a penny — and fly linked to a tether. Drew’s tiny robots might someday be used to monitor air quality, search for disaster survivors in confined spaces, and even pollinate plants in place of real-life insects during local extinction events. However, the technology will need some more time for development. Drew and his team are now working to make their ionocraft robots more power and faster, and to make them steerable. Ultimately, he imagines humans psychologically interacting with swarms of tiny robots, teaming up with them in VR simulations. Drew aims to make the ionocraft efficient enough to carry tiny on-board batteries and stay aloft for ten minutes at a stretch. Drew’s team is not the only group hoping to harness the power of tiny robots. Scientists at Japan’s Hokkaido University have developed a miniature robot created from organic compounds that move when exposed to blue light. These miniature robots might one day be used to deliver medicine inside the body to targeted areas. NASA has also been working on a lightweight bot called the Pop-Up Flat Folding Explorer Robot (PUFFER). This tiny robot is able to climb steep slopes and adapt its shape to fit through tight spots. Drew demonstrated one of his bots at a conference in July, but has not said when he expects his ionocraft to be ready for use.